Today, Super-I Enterprise Co Ltd is one of the largest manufacturers of rivet fastener, eyelet, bag buckle, snap hook, bag handle, snap button, jeans button, prong snap, carabiner, and other many kinds of hardware accessories. Super-I specialized in making high-grade hardware under the brand of "Super-I", the registered trademark for more than 20 years. we Produce different styles and applications for a wide rang of industrial uses on an international scale. Obtained the right of import and export business from the government, monthly production capacity reached 800,000,000 PCS, more than 80 percent of its production is exported all over the world, covering Europe, America, Australia, Asia, Africa and Middle East. Super-I provides various types of hardware, such as rivets, eyelets, plastic buckles, hooks, handle and jean buttons. Them manufactured in Super-I are used in the following applications : sports, travels, shoes, leather, clothing, stationery, luggage bag accessories, baby carriage, manufacturing specialties and so on. 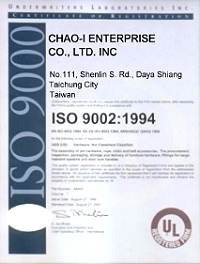 We manufacturers to customer requirements with short turn-around times, and joined Taiwan, China Hardware Products Association in 1991.